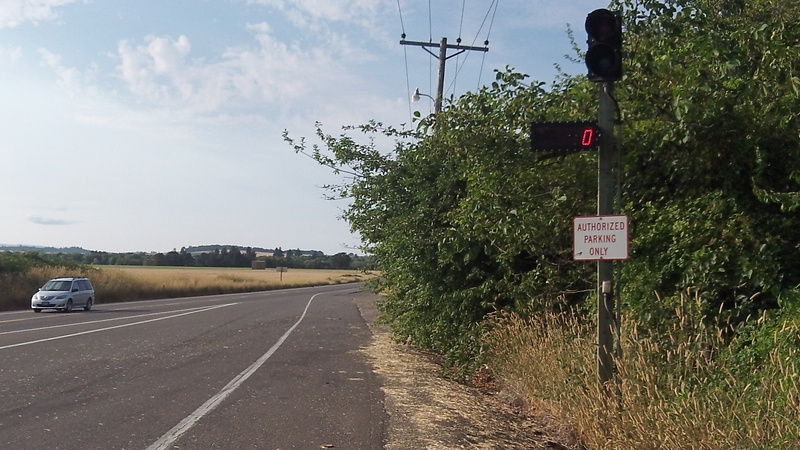 You can check the weight of your car — or you and your bike — at the Adair scale. One of the nice things the Oregon Department of Transportation does for the public is to leave some of its truck scales on even when they are not staffed, which is most of the time. I learned about this when I asked ODOT about the Adair weigh station on Highway 99W. That scale is on one of my regular routes for bike rides, and I always make a point of slowly rolling across the steel plates that register a truck’s axle weight. That scale was originally installed many years ago to capture a large volume of log-truck traffic, says Ed Scrivner, the ODOT Field Services manager who oversees the department’s truck size and weight enforcement program. ODOT has 88 scales around the state and 75 enforcement officers to staff them. The one at Adair has been worked sparingly on a random schedule since logging traffic dropped sharply in the nineties. But like others, it is left on so truckers can check their rigs’ weight on their own. And so can the rest of us.